The unidentified man, using a handheld metal detector, found the nugget on Wednesday, lying 60cm underground near the town of Ballarat. Its value has been estimated at more than A$300,000 ($315,000: £197,000). Local gold experts say gold has been prospected in the area for decades, but no such discovery had been made before. 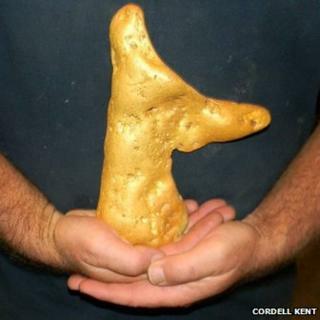 "I have been a prospector and dealer for two decades, and cannot remember the last time a nugget over 100 ounces (2.8kg) has been found locally," said Cordell Kent, owner of the Ballarat Mining Exchange Gold Shop. "It's extremely significant as a mineral specimen. We are 162 years into a gold rush and Ballarat is still producing nuggets - it's unheard of." A video of the Y-shaped nugget was posted on YouTube on Wednesday by user TroyAurum. He wrote that the man who found it had said it "sounded like the bonnet of a car through the headphones. "It was lying flat (broad side up) and he carefully dug it up." Gold currently trades in Australia at about A$1,600 per ounce, meaning the discovery would be worth about A$283,200, but its rarity and the fact it weighs more than a kilogram would add a premium, said Mr Kent. He told Australian media the prospector had been using a state-of-the-art metal detector, which meant he was able to find the gold relatively deep underground in an area which had been searched many times in the past. The man had only made small finds before, he said, but was a "person that really deserved it". "A finding like this gives people hope. It's my dream to find something like that, and I've been prospecting for more than two decades," the Ballarat Courier quoted him as saying. "I've got no doubt there will be a lot of people who will be very enthusiastic about the goldfields again, it gives people hope," said Mr Kent. "There's nothing like digging up money, it's good fun."